Hydraulically powered, the typhoon's drive system is so reliable we offer a 5 year warranty, a feature unmatched in the industry. The typhoon's simple design allows for only five moving components in the bay, thereby adding to its longevity. The less downtime, the more income. Our gear drive system has machine tool precision. There is no need to worry about low air or flat tires causing the machine to slip and skew. With the oasis unique drive, every movement is exact. 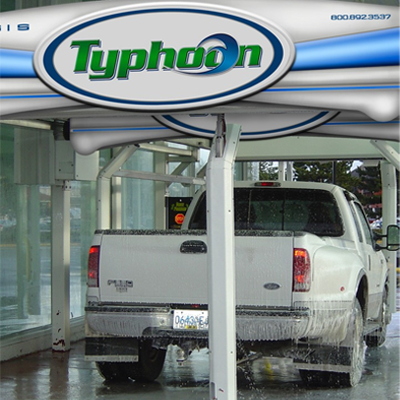 The typhoon's wall-mounted frame helps protect the unit from damage by water, chemicals and grime through its elevated carriage system. The typhoon is also more visually attractive than ground-mounted machines. The wall-mounted frame provides an open, spacious bay that is more appealing to customers.